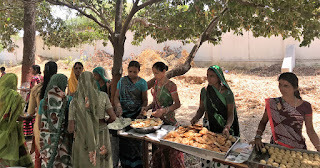 KAPADVANJ (Gujarat), 20-March-2019: DRISTI Don Bosco organized ‘International Women’s Day’ for more than 550 women from 44 villages under the aegis of ‘Sustainable improvement of living conditions in 100 villages of Gujarat’ Project funded by BMZ-Germany. After the main event, sumptuous lunch was served to all. The entire arrangement was done by the DRISTI team under the able leadership of Fr Mayank.